Welcome back to the BERNINA 125th Anniversary Quilt-Along! 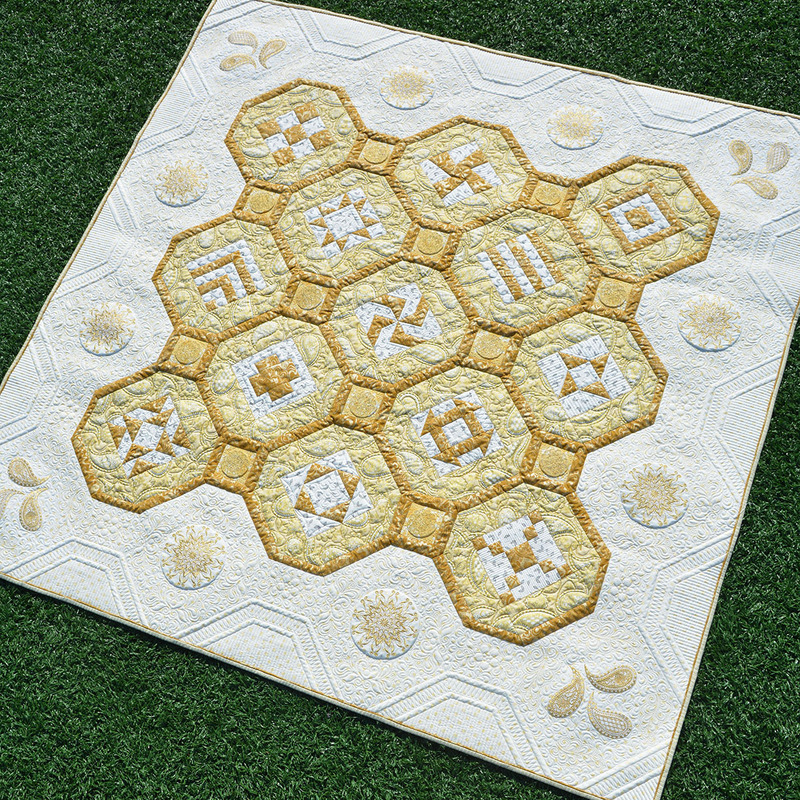 I’m BERNINA Expert and Amanda Murphy and in this post I’ll get you started on the optional embroidered cornerstone motifs for this quilt. Note: If you would rather skip the embroidery I’ll give you some other options at the end of this post. A detail of the cornerstone in the BERNINA 125th Anniversary Quilt. First, I’d like to cover some questions I’ve been receiving about the embroidery. I’m so excited to announce that BERNINA has decided to give out the embroidery files for this quilt to all of you! Thank you, BERNINA! This includes the file for this month, which you can download HERE. The other embroidery files will be coming out in subsequent months. (The quilting files will be available exclusively as part of the BERNINA 125th Anniversary Collection, which also features dozens of additional embroidery designs as well.) Both, the embroidery and the digitized quilting files are optional as far as the quilt-along is concerned, so please don’t feel you must have an embroidery machine to participate. Just a few of the motifs from the 125th Anniversary Collection. You have many thread choices. 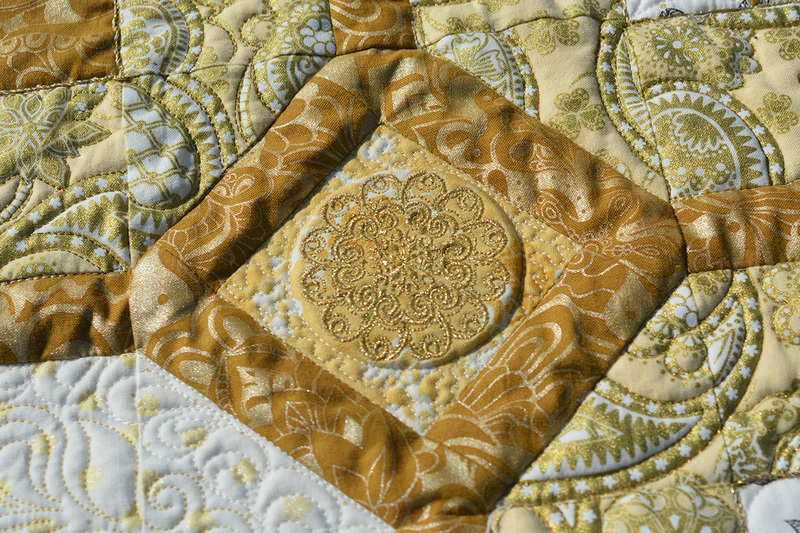 I embroidered the original quilt with Yenmet S14 Mayan Gold Metallic. 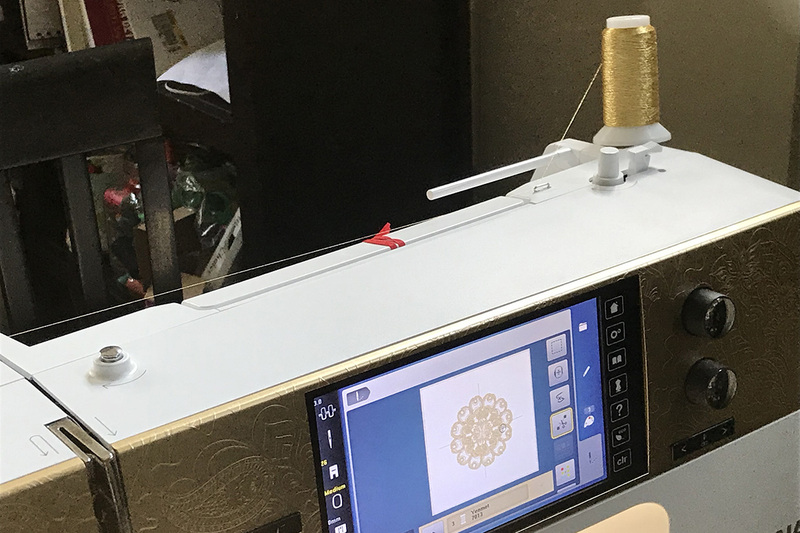 Embroidering with metallic creates a spectacular look, but it does take patience as you have to go at about 1/3 the speed of an embroidery using polyester threads. I went through four spools of Mayan Gold for the original quilt while I only used 2 spools of Isacord for the red version. If you choose to embroider with metallic, I would recommend using a metallic needle and lowering the top tension and using a similar color of Isacord (I used 0741) in the bobbin just to be safe. I tried using embroidery bobbin thread as well but I liked how the metallic behaved with the Isacord in the bobbin better. I also turned off my automatic thread cutting when using the metallic. How I threaded the metallic for best results on my BERNINA 790 Plus AE. If you are making the original version of the BERNINA 125th Anniversary Quilt with the gold fabrics but you’d rather use a polyester embroidery thread for a faster and easier finish, I’d recommend Isacord 0721. It is a great shade for this quilt and has a lovely sheen. The files for this piece have placement lines for your fabric to help make things easier. As usual, I’ve made a video to help you along. The instructions for the embroidery are on page 7 of the free PDF instructions we gave out earlier in the month. You can download them HERE. You can choose a different embroidered design. Note that this motif has a 57mm diameter. We piece very close to the design on the diagonal, so I wouldn’t recommend selecting a design that is any bigger and I’d stick with a circle. A design of this size with square corners would also not work well. You can fussy-cut a fabric. This would be an excellent place to use a medallion-style print. Keep in mind that you will only see the area near the center of the block. 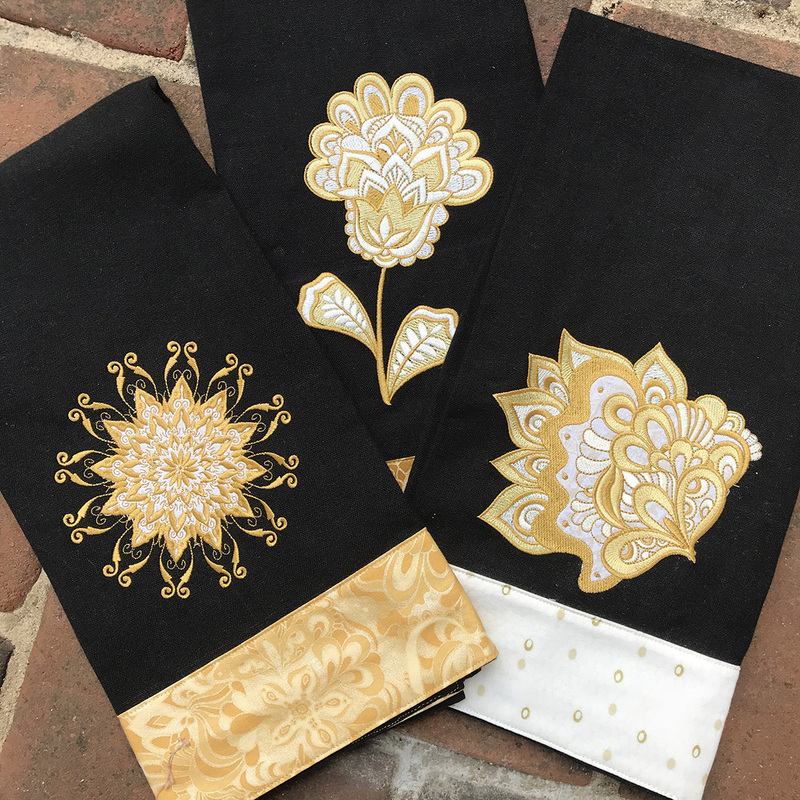 You can purchase the Jubilee embroidery panel and back the motifs on it with paper-backed fusible web and appliqué them down to the fabric squares. There are 12 of these embroideries to complete before we piece these cornerstone blocks in November. Last but not least, please remember to post your progress in WeAllSew’s Community! You can find the Community Tab at the top of this page. Remember that you have to post your progress six times in order to be eligible for a chance to win one of the amazing prizes so now is the perfect time to start! Show us your fabrics and/or your first blocks—we’d love to see! That is it! I’ll be back on October 3rd to get you started on the other half of the feature blocks. Share how you are progressing on Facebook and Instagram using the hashtags #bernina125, #bernina125quiltalong and #weallsew. Which of the supplies list come in the 125th anniversary kit and which need to be separately purchased? I know it comes with the top fabric – does it come with anything else? The kit includes fabric for the top and the binding. All other supplies, like the backing, thread, and stabilizer if you are doing the embroidery, must be purchased. The paisley print comes in six different colors of wide backs. Embroidery files will be included on the blog post. If you want the quilting files that I used as well, they will be available for purchase as part of the Jubilee 125th Anniversary collection. 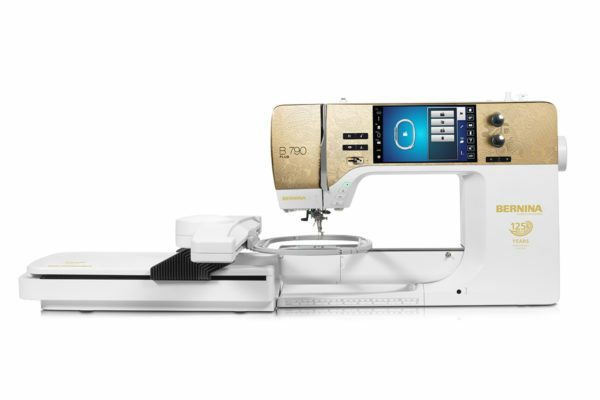 I have a 750 QE w/o the embroidery unit, but my sister has the exact same machine. If I’ve never used the embroidery unit, how difficult will it be for a ‘beginner’ to embroider the blocks vs. appliqué? Also, what do I download the files to? A USB stick? There will be videos posted for the embroidery that should be helpful to you. The first is already posted above. But I’d also really recommend an embroidery class at your local dealer to help familiarize you with the embroidery process. It just is so much easier to see it done in person when you are learning for the first time. And, yes, for most embroideries you transfer the files over with a USB stick. I complete agree with Amanda’s suggestion to get “in-person” assistance with the embroidery unit. I just bought one of the Anniversary Edition machines . I have never used an embroidery module before and my Bernina Dealer signed me up for the 4th class in the “Get to Love Your Bernina More than You Already Do” Series (my title!!). I had a wonderful 2 hour one on one with a lovely woman who showed me how to use the module and discussed all the ins and outs of threading the upper thread, the bobbin, tension, different threads and stabilizers, and maintenance. I had so many questions when I started and more that came up as she demonstrated. It was fun and I feel confident to do the embroidery for this quilt! If anyone is looking for the jubilee quilt kit, BERNINA World of Sewing located in Raleigh NC has them. They will also ship the kits to you. 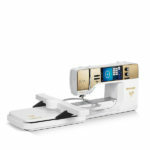 They can be reached at 919-782-2945.
for the free embroidery files is there any way to get the jef format for Janome. I have ordered the usb but it has not come in yet. can you get the files in PDF? Maybe I’m not understanding what you are asking? Where can we find the embroidery designs for this quilt? The only one I have been able to locate is the cornerstone motif. Thanks in advance. Each embroidery design is being released the month I present it. The corner embroideries will be released in my next post on December 19th.